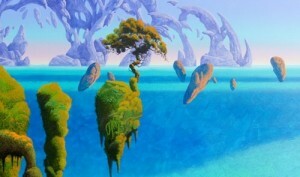 One of last year’s special guests – and now friend of the Isle of Man Film Festival – artist Roger Dean is over on the Island to host an exclusive reception tonight to launch his new exhibition “Islands and Bridges”. This is a free exhibition and we urge as many people as possible to check out Roger’s wonderful work at the Manx Museum. Manx National Heritage are running the exhibition from tomorrow (Saturday 20th August) to 19th November 2016. IOMFF15 Pitch Fest Films In Production!